Country space & tranquility, 5 mins to town. Top quality, affordable & clean. Children to 17yrs stay FOC so DO NOT include in your guest numbers. Modern well appointed kitchen, DVD,s, books, games, candles, fireplace, space for kids to run around, toy chest, hammocks, vegetables in the garden for you to enjoy. **NOTE** This is a traditional 'Kiwi Bach' - to keep the cost down for those that appreciate it, for bookings of up to 4 nights you have the choice to either BYO linen & towels or hire ours for $20pp, to be paid in cash at the time of the stay. Either way we still provide duvets with covers, pillows & blankets. For bookings of 5 nights or more we include linen in the advertised nightly rate. One night stays available at our discretion and a $30 surcharge applies to help cover our fixed cleaning cost. Affordable luxury - from spa pool (hot 24/7) to iPod dock, your every need has been thoughtfully anticipated. On five acres. North facing so warm and sunny all day. Beautifully planted. 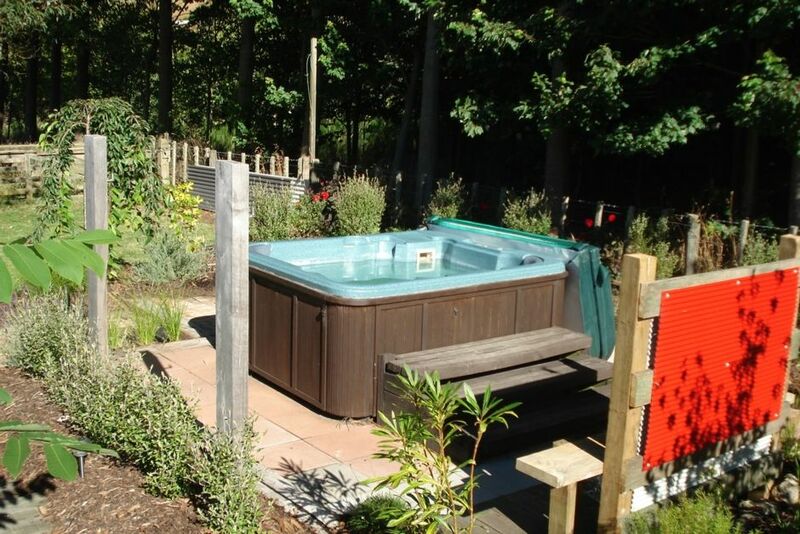 Completed with hot tub and a stunning back drop of 15000 trees, Korunui provides your blissfully relaxing home away from home. ** 15km from Kinloch Village. There are rented 2 dwellings on the property making it great to spend holidays with family or friends. Click on the 'manager' link to view The Bungalow. The spa pool is shared with the other dwelling - there are not 2 spa pools. NOTE the automated booking total when you request is not always correct due to some of our freebies and add ons. Linen & towels can be provided @ $20pp For stays of 5 nights or more they are included. Either way we supply duvets, blankets & pillows. Awesome comfy accommodation and loved being able to use the vege garden - hosts were friendly and helpful and really enjoyed our 2 nights there. Would highly recommend. plenty of toys for 2yr old, comfortable , warm well appointed in rural location. Easy to find and access. No contact with hostess even though she was present on site which we found a little odd. No welcome or initial greeting or even acknowledgement of our presence when our paths crossed. Disappointed to be told that linen charges were extra after we had booked as we thought price was high enough without adding a linen charge. overall, a well appointed modern property which was warm dry and comfortable. Never used the spa but everything else was excellent. Certainly would consider using this facility again. Glad you enjoyed all we offer Helen. We have been particularly busy finishing a renovation project in town in and around our day job and the accomodation. This is one of the reasons I didn’t make it over to greet you. Being in that your daughter was on the property & I had welcomed her group & showed her where you were staying I had thought that would suffice. Had I encountered you I definately would have said hello. I did not see you. I’m sorry that the spa pool & compost instructions offended you. They are necessary for smooth runnings and less damage to spa than what we experienced before putting that up. It has save us about $3000 over a year so is needed. That fact that we keep our nightly rate down by offering linen & towels as an additional extra is appreciated by most people, especially those that are less financial. This option is very clear in the very first paragraph or our listing description so there is no reason it should have been a suprise other than you didn’t read. With this new website platform this is the only way we can offer this option. With Bookabach is was a standard practice & a box that could be checked in the booking process. Unfortunately these new dictatorial platforms are making it harder and harder for the kiwi bach ethos to survive. Having done this for 8 years now with only gratitude for what we offer, we are now experiencing more and more complaint which has us considering removing our beautiful property from public use becuase its just not so much fun anymore. Such a shame. Glad your overall stay was enjoyable :) Based on that and considering everything that we offer at such a good rate, a 3 star rating, that effects our overall ranking when others search, is pretty harsh. The Cottage is in the country so spiders are to be expected. The cats are advertised as being on the property, there's not much we can do when guests don't read listings before they book. A beautiful cottage, set up perfectly for complete relaxation. We had a wonderful stay Korunui Cottage. Fantastic location, it had everything you need and more like toys for the kids. Beautiful grounds, comfy beds and lovely outdoor eating area. We really enjoyed the place and Justine was very welcoming. The kids had games and room to play inside and outside. Very peaceful and close enough to the city.